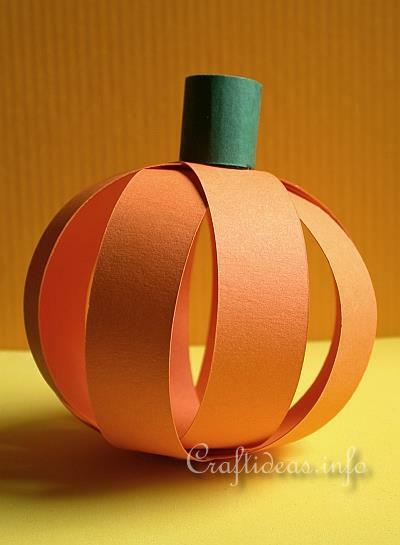 With just a few strips of paper and two gold brads and you can create this autumn pumpkin within minutes. 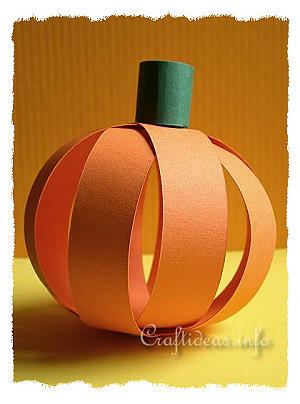 By using shorter lengths and widths of paper, you can also create smaller versions of this pumpkin. 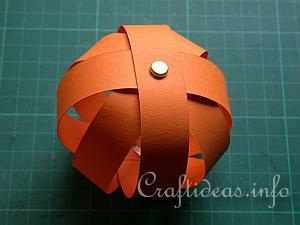 Kids will also enjoy making this project. 1. 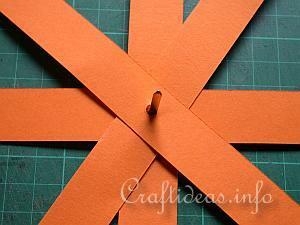 Cut out four 25 cm x 2 cm lengths of orange cardstock. Punch a hole in the center each end about 5 mm from the edge. Now you have 8 holes. 2. 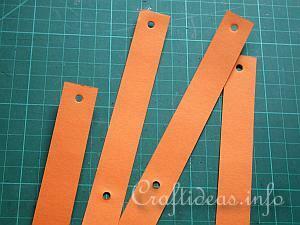 Then you will also punch a hole in the exact center of each strip. 3. Place the center hole of each strip onto one gold brad. Make sure the strips are evenly crossed over each other. 4. Starting with the bottom most strip, pull both ends up and insert the holes onto the second brad. This brad is facing down (the prongs are facing the paper). 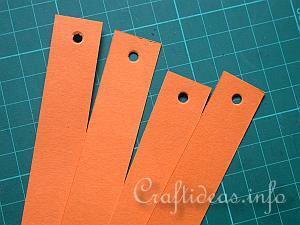 Now continue with the the next paper strip in the same manner until you finish with the uppermost strip. Close the brad to hold these strips in place. 5. 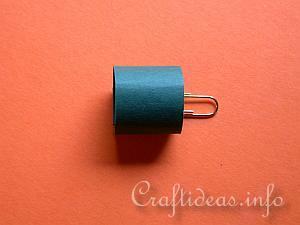 Create a stem by rolling 2 cm x 4 cm piece of green cardstock and adhering the ends. You may need a paper clip to hold the ends together until it has dried. This will now be adhered to either end of the pumpkin over the brad. Copyright: Please read this Copyright Information about using the images of this website.